Can Jeremy Lin, James Harden, Houston Rockets Get Past the Spurs? The last time Houston and San Antonio met the game turned into a shootout, with Jeremy Lin scoring a season high 38 points and the two teams going through 11 ties and 15 lead changes. That game ended with a 134-126 San Antonio victory in overtime, a blown opportunity for a Rockets team that didn’t experience much joy in the two sides’ first matchup. The Rockets figured out in game two of this four part season series that if they can manage to at least compete on the boards and use Lin’s quickness to penetrate and kick out to open three point shooters they can hang with San Antonio. The Rockets won’t be content to just hang with the Spurs, however. Coming in on a five game winning streak, the team is looking to make a statement that their youth and inexperience isn’t enough to cost them a postseason berth. Houston is now 16-12 and sit third in the Southwest Division as a playoff contender. In order for the Rockets to continue their recent success, they’ll have to get another big night from Lin as they are 5-1 when he scores 18 points or more alongside James Harden, who has been the team’s backbone averaging 25 points per game. But just as important as anyone on the team scoring more, the Rockets will have to stick to their recent commitment to defense. In their last meeting, Tony Parker, Manu Ginobili and Gary Neal combined for 78 points, a stat that can’t repeat itself on Friday. To add to that, Houston gave up 45 points in all to San Antonio’s bench, a recipe for disaster given that the time without Duncan and Parker on the floor is the best time to close a gap or spread a lead against the Spurs. In six of Houston’s last eight games, their defense has shown improvement as they have given up less than 100 points after averaging 104 points allowed just a few weeks ago. In the team’s last outing, they won in uncharacteristic fashion topping Minnesota 87-84, showing that they don’t have to run up the score line to win. But, if that same story repeats itself against San Antonio, don’t be surprised if the Spurs win. Gregg Popavich’s team will look to hound the Rockets behind the three point line after letting them shoot 53 percent from beyond the arc last time out. The Spurs will bring to the table what you might expect from a team with their experience. Last time out they shot over 50 percent by racking up 56 points in the paint and holding Houston’s high paced offense to just 10 fast break points. That will once again be the game plan. Where the Spurs will look to improve is keeping Duncan in the game. In their Dec.10 meeting, the 36-year old veteran struggled to stay on the floor due to foul trouble and contributed just 10 points in his worst offensive performance of the year. If San Antonio does keep him involved and limits Omer Asik’s effectiveness (21 points, 10 rebounds last game), then the Spurs will have the front court advantage they had the first time these teams met, a 114-92 victory in which San Antonio led by 33 at one point. The Spurs will pick and roll the Rockets to death and be prepared for another shootout. The Rockets are the second best fast break team in basketball and will look to exploit the Spurs 15 turnover per game average to create a fast pace. San Antonio can actually match the Rockets for fast break points, but where they’ll really look to beat them up is on the interior again. The Spurs grabbed 49 rebounds last game and 50 in their first outing. More rebounding leads to second chance opportunities and points in the paint, an area they have a distinct advantage over the Rockets. If Houston can go to Asik early and see him get Duncan in foul trouble again, they may be able to compete, but with Duncan playing the way he is currently (averaging 17 points and 10 rebounds), the game will be tough for Kevin McHale’s team. At home, the Spurs are 11-2 while the Rockets come in with a road record of 5-7. I’ve never been one to play up the meaning of home court advantage, but in this one, there appears to be significance. San Antonio doesn’t struggle much at home and will have the crowd and their fair share of the calls behind them. If Houston is looking to make a statement about who they are, they’ll not be able to find a bigger or tougher stage than this game any time soon. 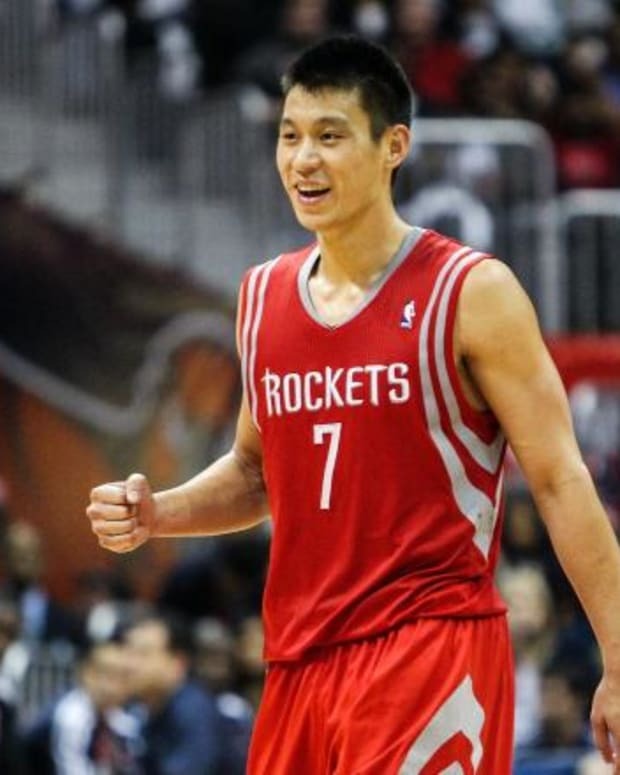 Houston Rockets to Trade Jeremy Lin?